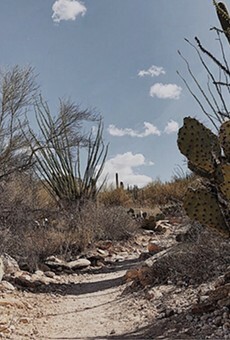 Hohokam Indians used to traipse around Sabino Canyon, using well-worn paths as corridors to higher elevations, where they gathered acorns and berries, harvested cactus fruits and agave hearts and hunted rabbits and deer. They built check dams to catch rainwater to nourish their crops of corn, squash, beans and cotton. And on the canyon floor, they constructed mortar pits in the boulders and bedrock where they ground mesquite beans. Some hikers of today go looking for remnants of that past civilization that mysteriously collapsed about 1450. For those who move at a leisurely pace and exercise visual vigilance, shards of pots broken hundreds of years ago, some still bearing traces of painted designs, can be spotted along with occasional finds like metates and spear points. (Look but don't touch, please.) Other travelers set out with no specific agenda other than to just hike the canyon to enjoy the contemporary sights, smells and sounds of the evolving landscape that's been here, in one configuration or another, for 12 million years. Since the last major earthquake sliced off major slabs of the mountainside in the spring of 1887, changes in Sabino Canyon have been less dramatic and much slower. "Over a human lifetime, the canyon may seem to change hardly at all," writes David Lazaroff in his book, Sabino Canyon. Vote of note: "Sales tax"